Expand the size of an image by an integer factor in each dimension. The output values are obtained by interpolating the input image. The default interpolation type used is the LinearInterpolateImageFunction. The user can specify a particular interpolation function via SetInterpolator(). Note that the input interpolator must derive from base class InterpolateImageFunction. The filter is templated over the input image type and the output image type. This filter is implemented as a multithreaded filter and supports streaming. This filter only works for image with scalar pixel types. For vector images use VectorExpandImageFilter. This filter assumes that the input and output image has the same number of dimensions. Definition at line 67 of file itkExpandImageFilter.h. Definition at line 77 of file itkExpandImageFilter.h. Typedef support for the interpolation function. Definition at line 99 of file itkExpandImageFilter.h. Definition at line 103 of file itkExpandImageFilter.h. Definition at line 111 of file itkExpandImageFilter.h. Definition at line 95 of file itkExpandImageFilter.h. Inherit some types from superclass. Definition at line 92 of file itkExpandImageFilter.h. 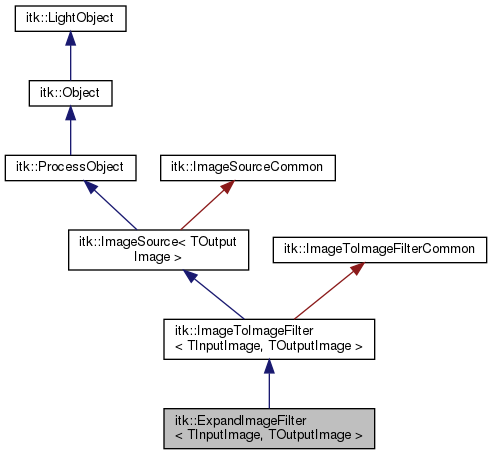 Definition at line 101 of file itkExpandImageFilter.h. Definition at line 100 of file itkExpandImageFilter.h. Definition at line 96 of file itkExpandImageFilter.h. Typedef to describe the output image region type. Definition at line 86 of file itkExpandImageFilter.h. Definition at line 93 of file itkExpandImageFilter.h. Definition at line 94 of file itkExpandImageFilter.h. Definition at line 76 of file itkExpandImageFilter.h. Definition at line 74 of file itkExpandImageFilter.h. Definition at line 75 of file itkExpandImageFilter.h. This method is used to set the state of the filter before multi-threading. ExpandImageFilter is implemented as a multithreaded filter. Therefore, this implementation provides a DynamicThreadedGenerateData() routine which is called for each processing thread. The output image data is allocated automatically by the superclass prior to calling DynamicThreadedGenerateData(). DynamicThreadedGenerateData can only write to the portion of the output image specified by the parameter "outputRegionForThread"
ExpandImageFilter needs a smaller input requested region than the output requested region. As such, ShrinkImageFilter needs to provide an implementation for GenerateInputRequestedRegion() in order to inform the pipeline execution model. ExpandImageFilter produces an image which is a different resolution and with a different pixel spacing than its input image. As such, ExpandImageFilter needs to provide an implementation for UpdateOutputInformation() in order to inform the pipeline execution model. The original documentation of this method is below. Set the expand factors. Values are clamped to a minimum value of 1. Default is 1 for all dimensions. Definition at line 89 of file itkExpandImageFilter.h. Definition at line 170 of file itkExpandImageFilter.h. Definition at line 171 of file itkExpandImageFilter.h.